Update: The launch was delayed 24 hours to Wednesday due to unfavorable upper level winds as seen in weather balloon data gathered in the early portion of Tuesday’s countdown. 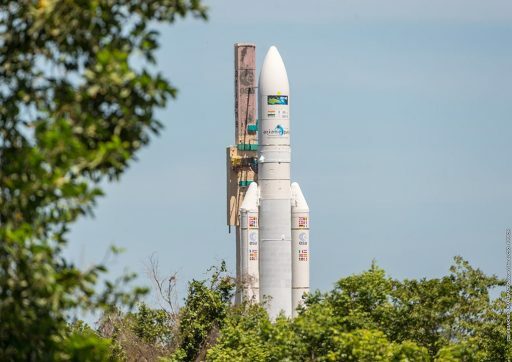 Liftoff from the equatorial launch site is set for a 75-minute window opening at 20:30 and Ariane will need 32 minutes to drop the two satellites off in their highly elliptical transfer orbits. The mission, designated VA231 in Arianespace’s numbering system, is the fifth Ariane 5 launch of 2016 with another two scheduled before the end of the year including the first Galileo navigation satellite launch on Ariane 5. 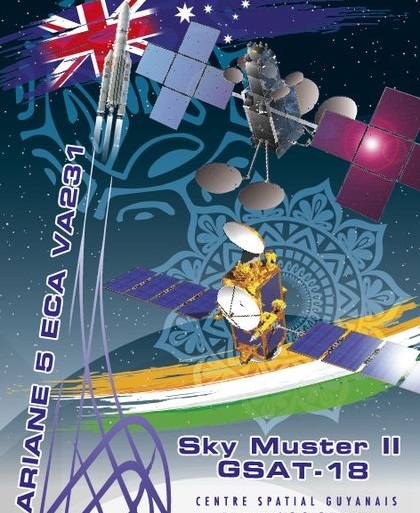 VA231 has a total payload of 10,663 Kilograms comprised of the Sky Muster II satellite riding in the upper berth while the smaller GSAT-18 is installed underneath the rocket’s Sylda adapter. 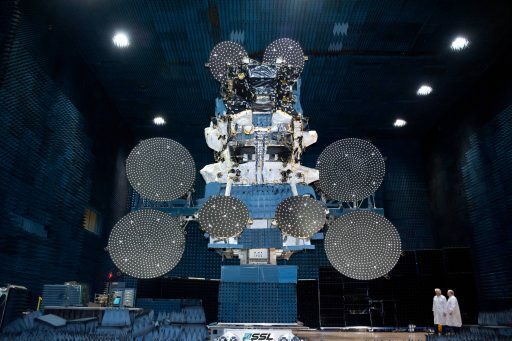 Sky Muster II, or more formally NBN Co 1B, is the second in a two-satellite constellation designed to deliver high-speed broadband to remote areas of Australia to bridge the digital divide and bring state-of-the-art connectivity to over 400,000 users that are not connected to equivalent terrestrial infrastructure. The A$2-billion project was initiated in 2012 when NBN (National Broadband Network) awarded Space Systems Loral of Palo Alto, California a contract to build both satellites. Among the largest communications satellites currently in operation, the Sky Muster spacecraft are essentially carbon copies, weighing in at 6,400 Kilograms each and hosting a powerful Ka-Band payload to generate 101 communications spot beams delivering capacity to remote areas in the outback, Australia’s coastal islands and external areas as far as Antarctica. Each of the satellites supports a data throughput of 80 Gigabits per second. GSAT-18 continues a decades-long business relationship between Arianespace and the Indian Space Research Organization, marking the 20th ISRO satellite launched by Arianespace. ISRO relied on foreign launch vehicles for the past three decades due to the lack of an indigenous heavy-lift vehicle capable of launching the heaviest of India’s satellites. The number of foreign launches is expected to decrease in the coming years as India’s Geosynchronous Satellite Launch Vehicles finish development testing and a regular flight rate is established. 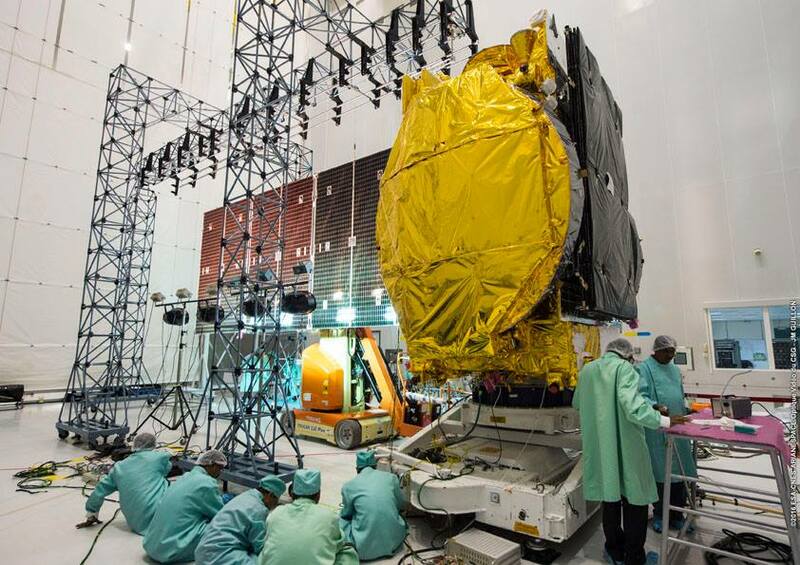 GSAT-18, weighing 3,400kg at liftoff, will become a part of the Indian National Satellite System to provide replacement and expansion capabilities using a multi-Band communications payload that features a total of 48 transponders in the Ku-Band, standard C-Band and Extended C-Band. Co-located with other INSAT satellites, GSAT-18 will support television, telecommunications, Digital Satellite News Gathering and VSAT services across the Indian territory. GSAT-18 was originally planned to launch in July of this year along with the Japanese Superbird 8 satellite operated by Sky Perfect JSAT and hosting a military X-Band communications payload. However, in late May when the satellite was shipped to French Guiana, a mishap occurred leading to an overpressurization within the sealed satellite container – causing significant damage to the spacecraft that would delay its launch by a year. Looking for upper-berth passengers that could be accelerated, Ariane 5 paired GSAT-18 with the Sky Muster Satellite and shuffled the Ariane 5 launch order with the all-Intelsat VA232 mission completed prior to this flight. 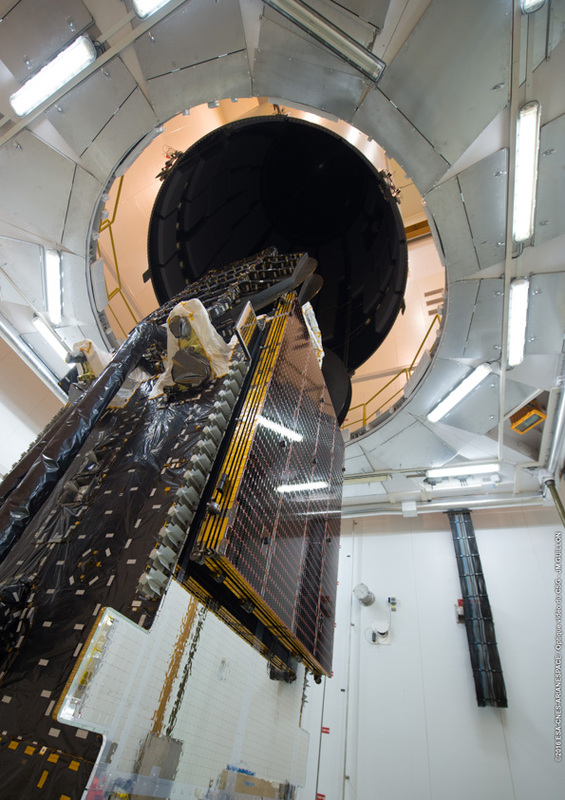 GSAT-18 – still looking at a July launch date – arrived in French Guiana on May 30 and went through checkouts in June including a solar array illumination test and fit checks on its payload adapter ahead of loading nearly two metric tons of propellants into the satellite’s tanks. 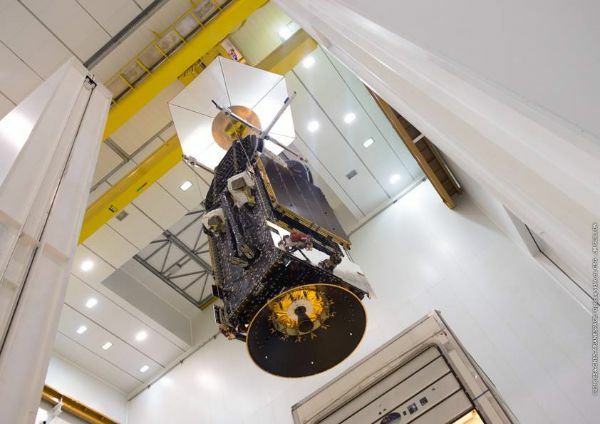 The Sky Muster II satellite was delivered in the last week of August and entered checks in early September before also being loaded with its dose of hypergolic propellants. 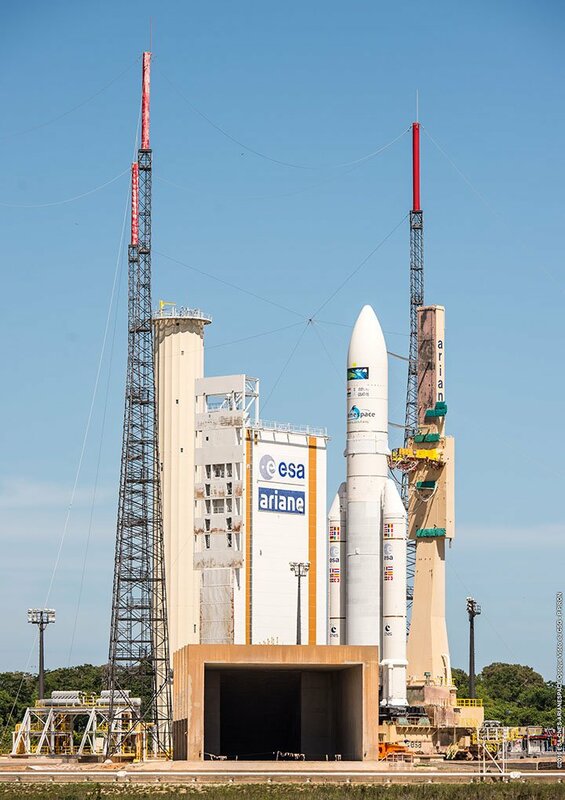 Ariane 5 moved to the Final Assembly Building in mid-September to set the stage for the two passengers to enter their slots, starting with the installation of the GSAT-18 satellite on the second stage of the rocket. 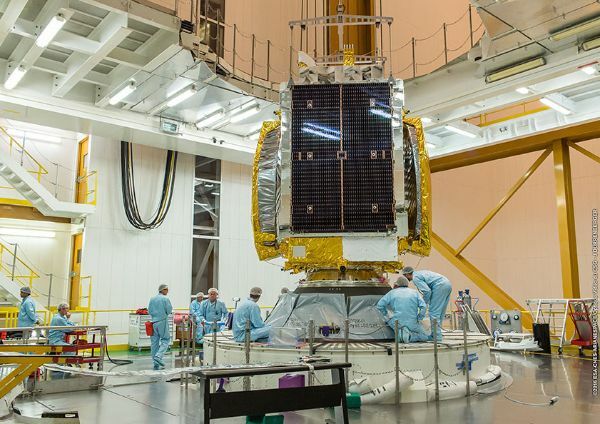 Sky Muster II was first integrated with the Sylda adapter and the 17-meter long payload fairing before the assembled stack was put in place over the Indian satellite that will be revealed during the flight after the upper berth has been vacated. 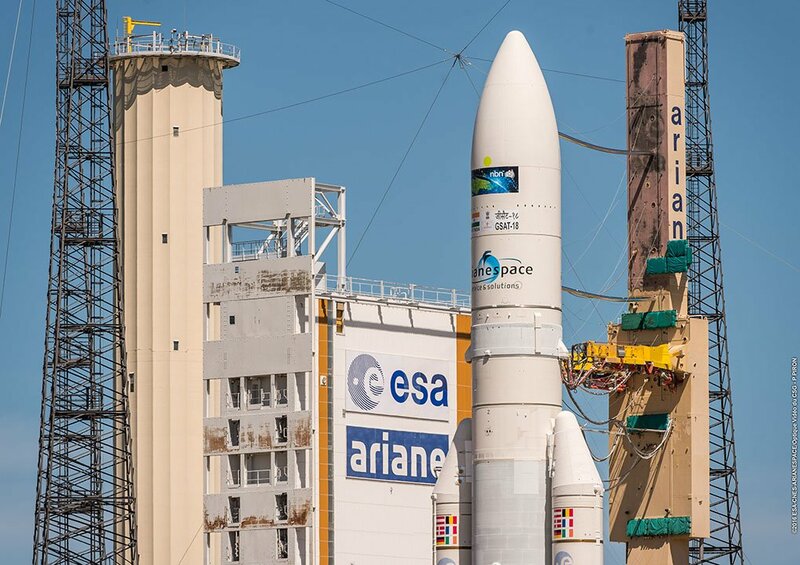 Last week was dedicated to the last set of Mission Rehearsals and checkouts on the assembled Ariane 5 as well as arming pyrotechnics installed on the vehicle for separation events. The Launch Readiness Review was held on Friday and provided clearance for Monday’s rollout to the ELA-3 site to set up for an 11.5-hour countdown operation on Wednesday. As part of the lengthy countdown operation, Ariane 5 will be powered up at T-7.5 hours and fueled up for flight starting five hours prior to the expected launch time to fill the stack with 174 metric tons of supercold liquid oxygen and hydrogen propellants. The final checks performed at the T-1 hour mark will clear the Ariane 5 for flight and the two passengers will switch to battery power before the final countdown sequence kicks in at T-7 minutes. When clocks hit zero, Ariane 5 will command the start of its Vulcain 2 engine which will then soar up to its launch thrust for the next seven seconds under close watch of automated systems that could trigger an abort in case the engine does not reach operational conditions. Liftoff comes when the two powerful EAP Solid Rocket Boosters ignite to catapult the 777-metric ton rocket toward the sky, generating 92% of the vehicle’s liftoff thrust. The 53-meter tall Ariane 5 will quickly align itself with a due easterly flight path, passing through the speed of sound 49 seconds after liftoff with Maximum Dynamic Pressure 20 seconds later. The 31.6-meter EAPs will burn out and separate at T+2 minutes and 23 seconds after each consumed 237 metric tons of propellant to help accelerate Ariane 5 to two Kilometers per second. Powered by the Vulcain 2 engine alone, Ariane 5 will continue its 20-minute flight across the Atlantic Ocean. Three minutes and 16 seconds into the mission, Ariane 5 will split open and separate its payload fairing halves to shed no-longer-needed weight as the vehicle will be out of the dense atmosphere at that point. The Vulcain 2 engine will be shut down eight minutes and 54 seconds after launch and the spent EPC core stage will drop away six seconds later. With the core out of the way, the ESC-A upper stage will fire up its 6,400 Kilogram-force HM-7B engine for one continuous burn directly into the desired Geostationary Transfer Orbit. The burn is expected to last 16 minutes and 13 seconds, aiming for an orbit of 250 by 35,786 Kilometers, inclined 6.0 degrees. After shutdown of the ESC-A, the flight enters its ballistic phase which starts with a re-orientation for the separation of the Sky Muster II satellite 28 minutes and 26 seconds into the flight, being sent on a mission of at least 15 years. The next step in Ariane’s orbital ballet is a retreat maneuver and re-orientation to set up for the jettisoning of the Sylda adapter two and a half minutes after Sky Muster separation. GSAT-18 is set for separation 32 minutes and 33 seconds into the mission, released into a slightly different orbit than the first passenger. From there, the two satellites will part ways to enter their positions in Geostationary Orbit. 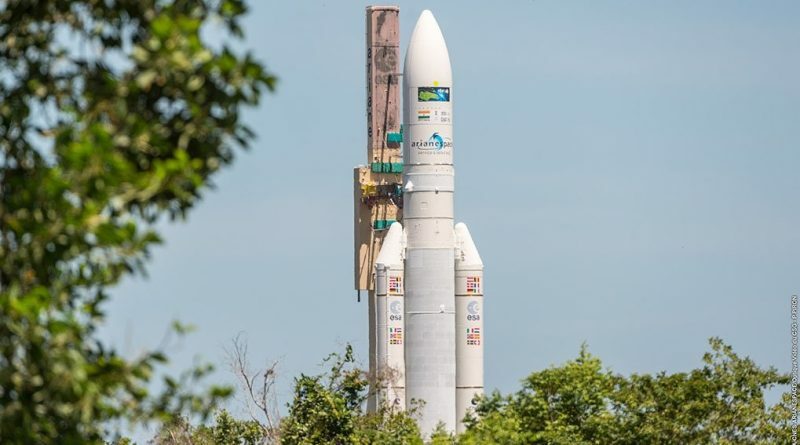 With both satellites happily on their way, Ariane 5 will enter a secondary mission to complete a series of engineering tests in the actual flight environment ahead of undergoing passivation one hour and 22 minutes into the flight.